Click here for a map of the Fairgrounds. The cost for admission is $7.00 per dog if you pre-register, $8.00 per dog if you register on the day of the event. Foster dogs get in free and will have a ribbon on their collars to show their status. Foster parents must pick up the ribbons for fosters at the registration table. Any humans coming stag (without dogs) are asked to make a donation. If you want to take advantage of the price break for paying for your tickets, you can register via snail-mail (deadline July 31) by sending a check, payable to IGRF, with your Iggies' registration to Ruth Beall, or you can register via PayPal (deadline August 3). Click here to print a registration form to mail in before July 31. Click here to register via PayPal by August 3. There are plenty of fun activities planned. Check the schedule of events for all the details! - Auction. Donations for the auction are welcome! We need lots of items donated to make this year a success. If you have items to donate, please contact either Kim at topironhorse2000@hotmail.com, or Ruth at rhbeall@hotmail.com to coordinate. - Drawings for awesome prizes!! - Toys, Coats, Martingales and lots of other items! will also be available for purchase. - Games include Tiny Hiny, Longest Tail, Shortest Tail, Yodeling Contest, Best Buns. Volunteers are needed for the games to be successful, so please sign up with Kim or Ruth at to help. - KISSING BOOTH! We have a new event this year - a KISSING BOOTH! 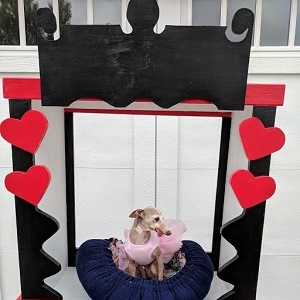 Come and meet miss Georgia (and maybe some of her friends) and get a kiss for $1.00! - Barbie Dog Contest!! Put on your best outfits or show off your Iggy 500 Pride. A panel of judges will determine the winner and a prize will be awarded for first and second place. Originality and owner look-alikes are given strong consideration. A blue ribbon medal and prize packages will be given to the winners. We have had quite a turn out with some really jazzy outfits in the past! - Food - We have arranged to have Nelson's Port-a-Pit Chicken (awesome broaster chicken) with potatoes. The Nelson's "Meal Deal" includes half a chicken, roasted potatoes, and a cookie for $10.00. Pizza, popcorn, cookies and drinks will also be available. Check out our "Vendor Booths" page to see the listing of Vendors who will be there!